A man suspected of attacking his wife with a chain saw in Whittier had been deported 11 times since 2005, immigration officials said. 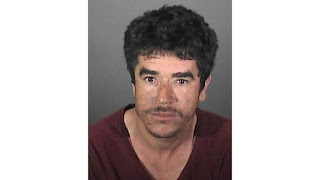 Alejandro Alvarez Villegas attacked his wife in their home Wednesday, with their three children inside, according to Whittier police. The 32-year-old then fled the scene in a stolen car. The woman was transported to a local trauma center where she underwent surgery, Officer John Scoggins said. “She’s currently recovering and expected to survive,” Scoggins said. Immigration officers have lodged a detainer against Alvarez, requesting that local authorities notify Immigration and Customs Enforcement before his release to allow them to take the man into custody, ICE spokeswoman Lori Haley said. “Department of Homeland Security databases indicate Mr. Alvarez-Villegas is a serial immigration violator who has been removed from the United States 11 times since 2005,” Haley said in a statement. He's not even very good at keeping under the radar. That's almost one deportation every year. Depending on criminal history, someone in the country illegally who reenters the U.S. after having been previously removed has committed a felony punishable by up to 20 years in federal prison, according to ICE. ICE did not provide his criminal history, but a search of court records showed that Alvarez pleaded no contest in 2013 to one count of unlawful possession of a controlled substance and one count of using or being under the influence of a controlled substance. Later that year, he pleaded no contest to driving with a blood-alcohol content of 0.08% or higher. Whittier police responded to the 7700 block of Milton Avenue about 3 p.m. Wednesday regarding an attempted murder stemming from a domestic violence incident, authorities said in a statement. When officers arrived, they found Alvarez’s wife suffering from “traumatic physical injuries, believed to have been inflicted by a chain saw.” Alvarez fled the scene, but detectives were able to take him into custody in Chula Vista on Thursday afternoon. Police said he would be booked at the Whittier jail on suspicion of attempted murder, child endangerment, hit and run, and grand theft auto. Yep; Mexico is sending us their very best.